PA cabinet chief says Trump administration cannot serve as a partner for peace between Israel and the Palestinians. 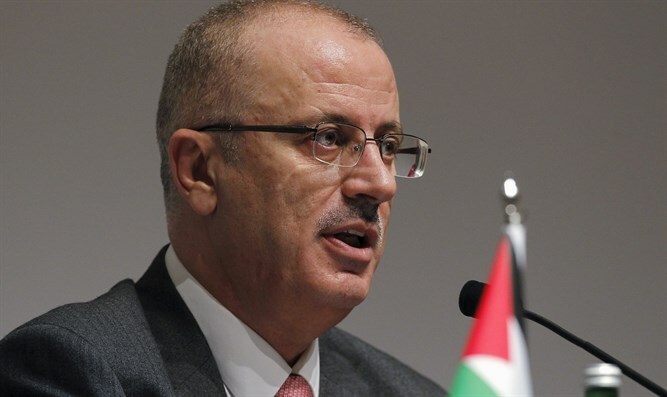 Palestinian Authority (PA) cabinet chief Rami Hamdallah said on Monday that the Palestinians would not surrender to the American "blackmail" that was expressed in the decisions made by the Trump administration in recent months, the last of which was the cut in financial aid to the PA that was announced on Friday. In a speech in Bethlehem, Hamdallah said that the U.S. administration is no longer a partner for peace, as it is now a partner to the "occupation" and to undermining security, not only in "Palestine" but in the region as a whole. Hamdallah called on the entire Palestinian public to unite around its leadership, headed by PA chairman Mahmoud Abbas, in order to deal with the challenges, including the so-called “Deal of the Century”, the American initiative that is being formulated to resolve the conflict with Israel. "The current stage requires everyone to demonstrate national responsibility for our [Palestinian] problem and for our holy places," Hamdallah said. In a message to Hamas, Hamdallah called on the organization to allow the PA cabinet to fulfill its responsibility in the Gaza Strip, stressing that "there will be no state in Gaza or a state without Gaza."